FSC Eucalyptus / 6 Slats / Box of 10 Deck Tiles. Free Sample: Please order free samples via our free sample program. Design: The 6 slat design is one of the classic designs in our collection. In this design, there are 6 vertical wood slats pre-screwed into the interlocking plastic base. 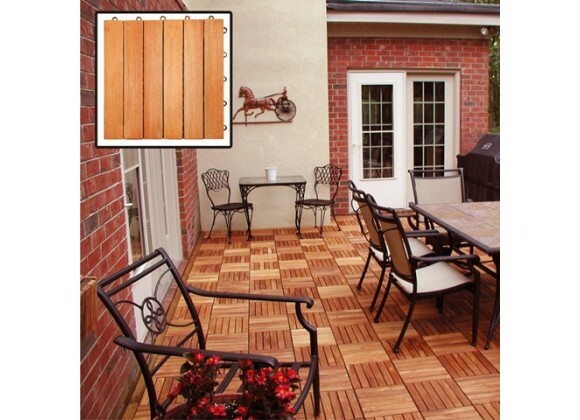 This design provides a classic, elegant look for any outdoor decking projects from small to large. Pattern: six horizontal slats per tile. Box of 10 tiles. Covers 10 sqft. Outdoor covering for patios, decks, balconies, porches, walkways, surrounding pools and hot tubs. Indoor covering for garage floors, basement floors, and bathroom floors. Pre-treated, expertly kiln-dried, extremely durable FSC Eucalyptus. Environmentally friendly non-endangered FSC Eucalyptus from controlled forests.